I facilitated an event for 50 people from an organisation last week, the theme of which was about improving collaborative working across the functional team. What's interesting about team awaydays like this is the tacit assumption that the participants are in fact members of a team at all. To illustrate, the group I was working with was made up of two interconnected but separate technical disciplines, two distinct product lines and delivery channels and four geographical locations. This means that although they might be a team in a hierarchical sense, in terms of the day-to-day each individual is focused more narrowly on smaller work units with whom they share strong links and goals. In this context, improving collaborative working feels more abstract than concrete. It also creates some conflicting priorities given that time is a limiting factor, i.e. is improving collaboration a choice between getting my work done and helping others? But if work in the 21st century is about developing ourselves as a node in a network rather than as a position in a hierarchy, then this demands a significant shift in how we think about organisations and about how individuals share knowledge, connect and contribute. On reflection, it occurs to me that the notions of teams, teamwork and team development might be reinforcing the taken-for-grantedness of the traditional view of what it means to participate with others. 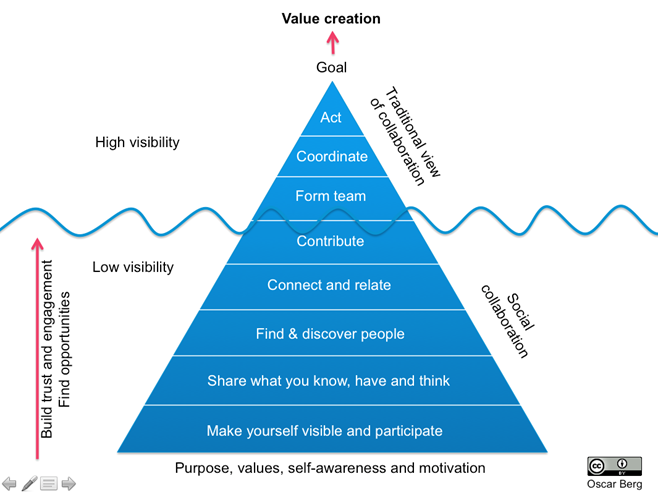 I shared Oscar Berg's collaboration pyramid because I like the distinction that Oscar has made between traditional, team-based collaboration and social collaboration. I have made a few notes of the things that I noticed as the participants worked through the exercises I had designed for them: network analysis of intra and inter team relationships, speed-dating to share work interests and expertise, brainstorming to generate ideas to improve collaboration and a couple of experiential team games. Most of the current work networks are task focused and reactive rather than proactive. For some, more time spent networking meant a binary choice between meeting or not meeting a work-based goal. Even within a group that calls itself a team, many people didn't know each others names or knew names but couldn't put faces to them. When forced to do so through the 'speed-dating' process, people enjoyed finding out about each other and making connections to both shared interests and new ideas. To complete the task in one of the team exercises, participants could either speak but not see or see but not speak. During the debrief, participants highlighted the assumptions that were being made: that everybody was feeling or seeing things exactly the same way and therefore that there was no need to share. However, it was clear that when individuals shared their knowledge, ideas or feelings there was always somebody who could benefit from and make sense of that experience; in the lingo of the social internet we would call this narration. Realisation that the new ways of working need to be given 'air' to develop. This means enabling lots of ideas to flourish by letting people follow their interests and participating with like-minded others regardless of where they sit in the hierarchy. Frustration that 'we have been here before' and therefore what is it that's going to be different this time? The tendency to reinforce traditional ways of working when it comes to taking action, post-event. I saw an interesting exchange between one of the participants and a senior manager in open forum with the former pressing the latter as to when the follow up meeting would be held to progress the ideas discussed. This struck me as being both reinforcing of traditional hierarchies and 'other-focused'. Some pockets of great ideas, for example as in an action that is already being taken to develop a wiki to enable shared development of cross-team resources, e.g. documentation. Encouragement from an individual who came to talk to me during a break. He was new to the organisation and had worked in a couple of other large companies were the social internet was being used actively. His comments were along the lines of this: "The social internet makes everything transparent. I've seen this work in an organisation with a tough-minded high performance culture; how much more could be achieved in one where the culture is already more collaborative?" Teams and collaboration are not mutually exclusive ideas but the latter extends and challenges a traditional view of teamwork. It also shifts our understanding of what it means to participate and contribute as an individual. The social internet is the enabler for collaboration and in many ways this is probably the easiest thing to solve albeit that it doesn't always feel this way when it means competing for IT development time and budgets . The tough part is in changing current working practices, loosening the ties to hierarchy and encouraging, recognising and rewarding the behaviours of sharing knowledge, connecting and contributing. I saw plenty to encourage me: of bosses willing to give air to new ideas and to allow new ways of working to emerge, as well as a few reminders that awaydays and their action points are not ends in themselves. Prompted by your previous post, I delved into Oscar Berg's Collaboration Pyramid and put it to good use in a recent module I delivered to Senior Leaders of a Big 6 Utilities Company. Thanks Chris. Collaboration in action.